LA may be on the brink of broiling through another heat wave, but that's not stopping me from plotting how to stay warm and chic this winter. 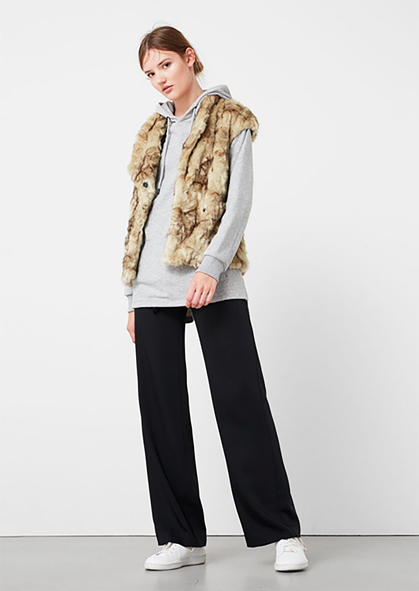 One unexpected, fun way: dressing up the humble hoodie--this fall's go-to layering staple--with a little luxe (faux) fur. The high/low effect is right up my alley! I could go for it with these hoodies from H&M, Topshop, Vince or Scotch and Soda, along with furry vests from Zadig & Voltaire, Diane Von Furstenberg, Mango (above), Michael by Michael Kors, and Chloe. P.S. I could also skip the hoodie and go straight up stylish with this Pixie Market piece! So I absolutely love this look! Unexpected makes it all the more interesting. I am loving Mango lately! Spot on!